Credit markets still vulnerable. Liquidity still an issue for the world banks. European mortgage and debt markets next to collapse after the US? 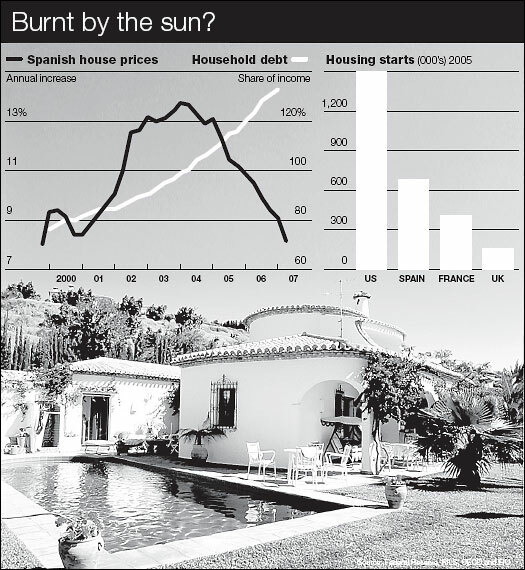 “Spanish household debt is also among the highest in Europe at 130 percent of disposable income. Heavy borrowing means Spanish banks are cranking up credit restrictions despite expectations the European Central Bank may be near the end of its rate tightening cycle. Europe may also be facing a housing mortgage /debt problem, ignited by the US decaying mortgage crisis and their accompanying bad debt circulating around the world. This entry was posted on September 7, 2007 at 6:17 am	and is filed under Finance and Economics. Strategy and Society. Tagged: credit crunch, spanish debt bubble. You can follow any responses to this entry through the RSS 2.0 feed. You can leave a response, or trackback from your own site. You just need to know what you need to be prepared, and where to turn for help. is utilized, via labour and other geographical incentives. This concept takes a crowd of people lending you small amounts equaling the amount you need.